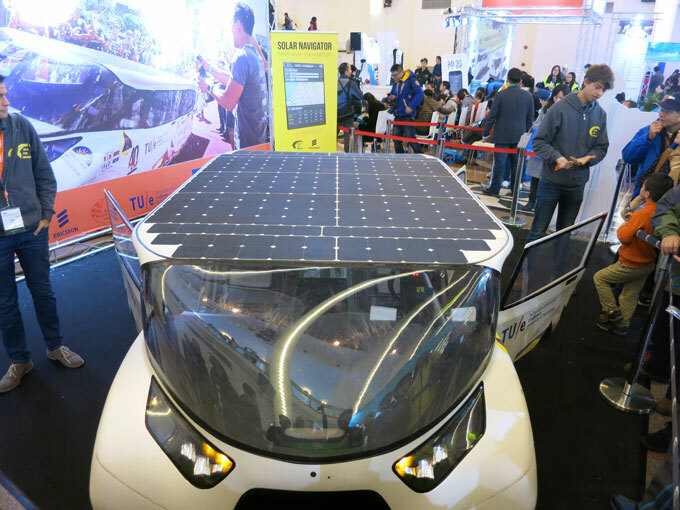 Last weekend, the team from Technical University (TU) Eindhoven that designed and built the Stella Lux spend a week showcasing the solar electric car in Shanghai. Good opportunity to have a close look at this family electric car that won the Cruiser Class of the World Solar Challenge! The Stella Lux EV has been build by a team of 23 students. They’ve worked on this project full time for a period of 9 months. 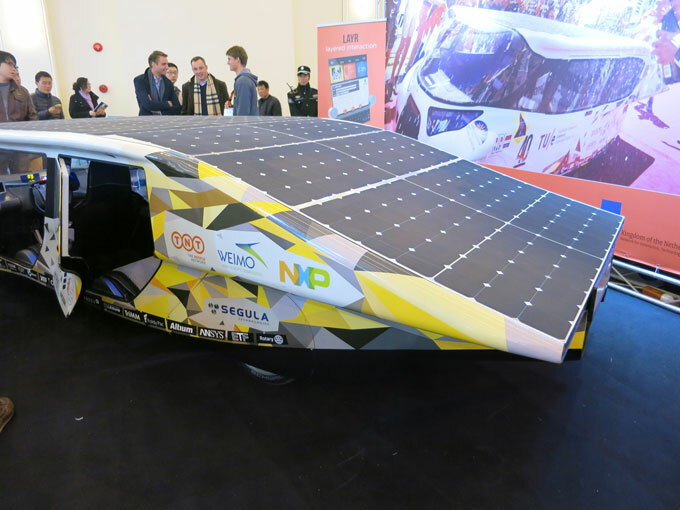 The team didn’t completely start from scratch as the Stella Lux is the successor of the Stella PV powered car, which also won the World Solar Challenge (2013). To keep the weight to the minimum, the electric car is mostly built with carbon fiber and aluminum. Stella Lux has a total weight of only 380 kilo. Interesting fact is that, despite the light weight, they’ve included lots of small details in the car, such as cupholders and mid-console part, that were 3D printed. The solar array consists of 381 individual solar cells, with a total power of 1.5kw. The cells were supplied by Sunpower. Standard backcontact mono cells, with a ‘special high efficiency pick’. No fancy GaAs or multi junction solar cells were used, as to make this car run with mainstream solar cell technology. Obviously to keep the weight down a standard glass encapsulated module wouldn’t do. 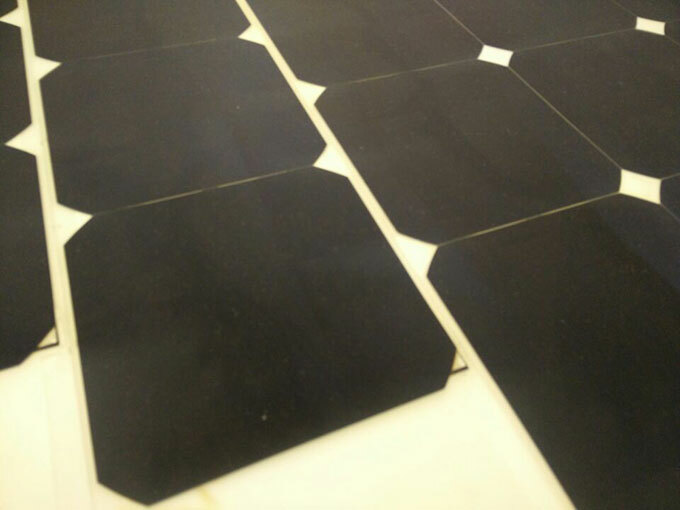 The light weight encapsulation was done by Gochermann Solar Technology. As you can see there are different inclinations on the car’s roof. Therefore the solar array was divided in 3 different circuits. Stella Lux holds a 15.2 kilowatt-hour Lithium-Ion battery pack and runs at approx. 150V. No risks taken here with Panasonic as the supplier. On a sunny day and on a full charge, the EV has a range of 1000 km (! ), with a maximum speed of 125km/h. The solar array can charge the complete battery pack in about 10 hours. A direct charge from the grid takes about 6.5hrs. Building a solar powered car that will go as fast and as far as possible is one thing. Building a solar powered family car is a whole different concept to start with. 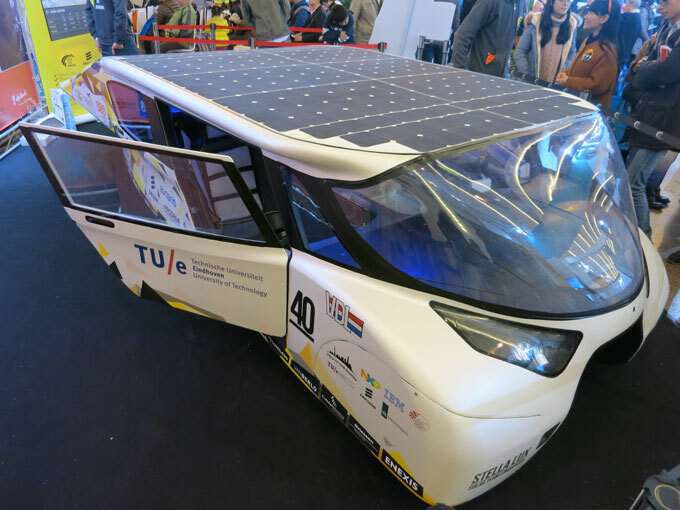 The main challenge for the engineering team from TU Eindhoven was to build a roadworthy family car, that also has the capability to compete in the World Solar Challenge that is very much about speed and range. The result is an energy positive family car. Energy positive means the car generally produces more energy than it can use. Taking into account the fact that cars are parked 95% of the time, the Stella Lux uses this time to charge the batteries. And as these results have been tested in The Netherlands (not the most sunny country, trust me on that), the performance is even better in sunny countries such as Australia. Aerodynamics hav been key in the design of the Stella Lux. One of their engineers explained that the aerodynamics have all been calculated. Wind tunnel testing would’ve been nice, however the time frame for building the car was limited: the car has been designed and built in less than 9 months, making it impossible to perform extensive wind tunnel tests. The car is fully road worthy in The Netherlands and even comes with Dutch license plates. Also it has all the ‘luxury’ you would expect from a family car, including storage for purchases. 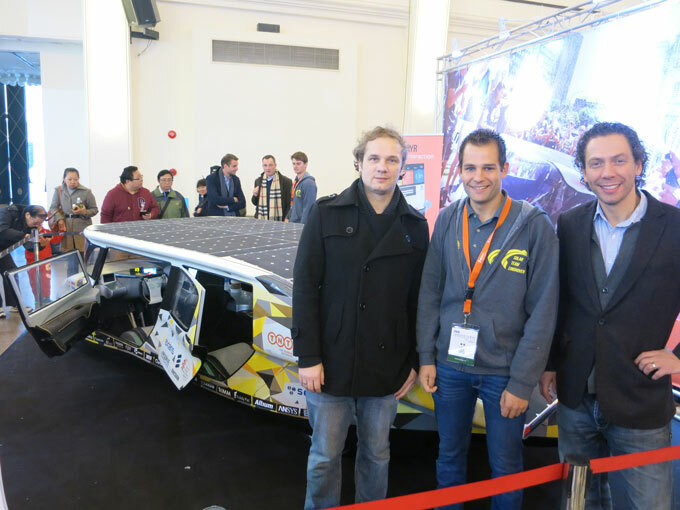 Meeting all the requirements was a difficult but important mission for the design team, as it would prove that nowadays a car can be fully powered by solar energy. Stella Lux is fitted with NXP Vehicle-to-everything (V2X) technology. V2X technology was built in to allow communication with the support car that is following behind. Both cars exchange important data such as battery levels, operating temperature etc. The team used this data to combine with for instance weather data and develop predictive models in real time. This was one of their ‘secret weapons’ to come up with a smarter strategy than the competition. V2X communication technology is now already being implemented in new model cars. It will allow cars to communicate with other cars, and receive information about traffic lights, road signs and be better informed about upcoming hazards. The same technology will soon also be used for autonomous driving. The car will receive signals from its surroundings and use this information to autonomously take action, leaving the passengers free to sit back and relax. The application is totally aimed at economic driving. 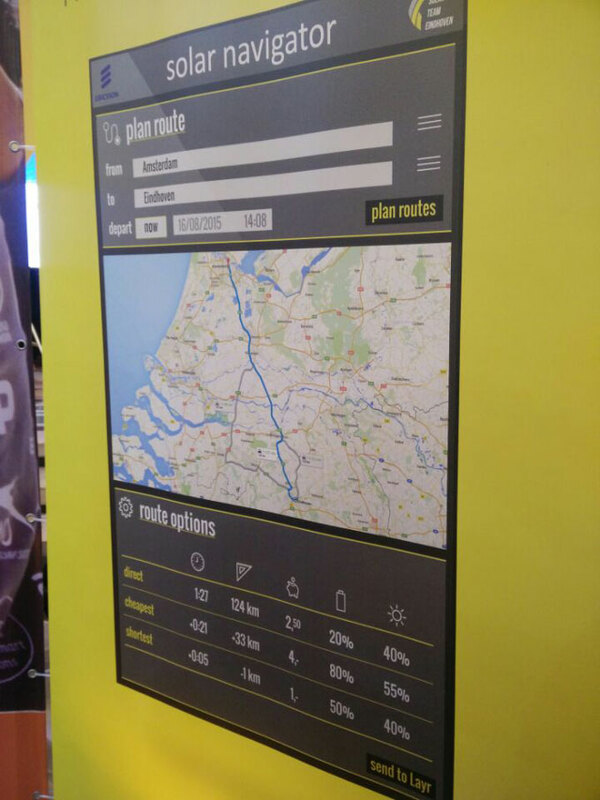 It collect weather and traffic data and suggests the optimal route, which will facilitate better decisions regarding the speed of the car during the race and the charging level of the batteries. The system continuously checks for the optimal routes, using the most accurate weather predictions and real-time traffic conditions, while knowing whether electric charging is required and how much energy can be discharged by the end of the day. Quite a neat tool! 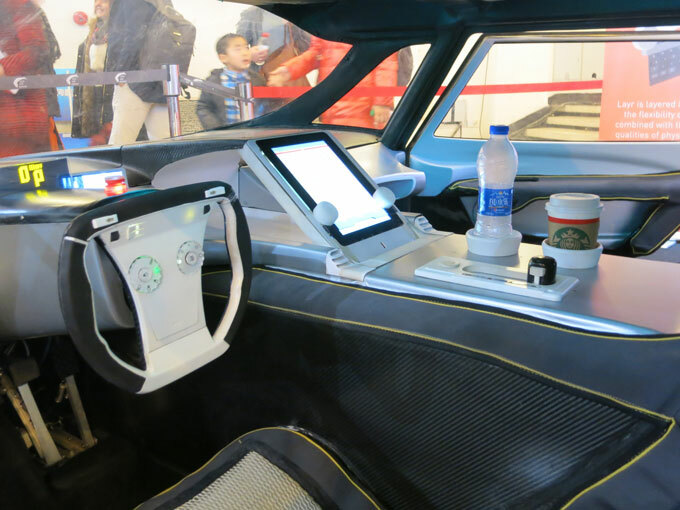 Other interesting built-in features are the wireless battery discharge capability, NXP’s wireless phone charging in the cockpit and RFID license plates. While the budget for this solar powered electric car has been kept a secret, seen the amount of sponsors it must have cost a significant amount to design and build this car. 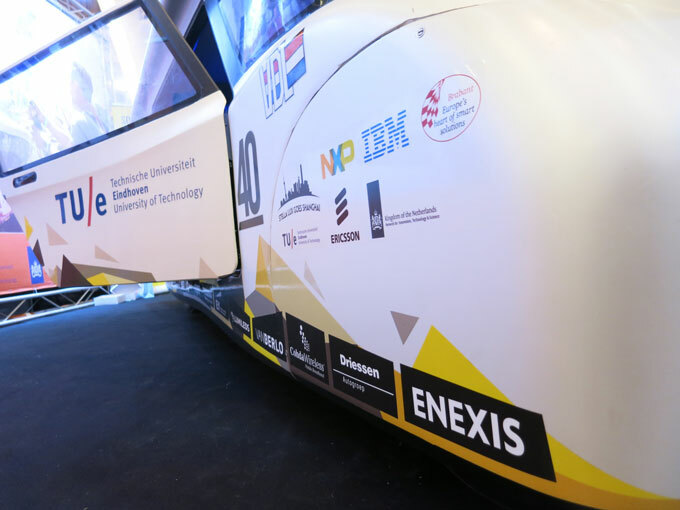 Sponsors and supporters of the Stella Lux include: Gochermann Solar Technology, TNT, Weimo, NXP, Segula, Rotary, ETF, Ansys, Altium, Foldy Pac, TriMM, Leeuw, Kappa, Yss, Ericsson, VDL, IBM, Lumileds, VanBerlo, Cohda Wireless, Driessen Autogroup, Enexis, Axians, ProDrive and more..
Will future cars be solar powered? Current cars are by far not suitable to be powered by solar energy. If you would put solar modules on a Tesla or Nissan Leaf, it would never be able to contribute a significant amount of power to the car. So to integrate PV, you basically need to design and build a car from the ground up, taking into account the aerodynamics, weight and available surface for PV cells. This is exactly what the engineering team from TU Eindhoven did. 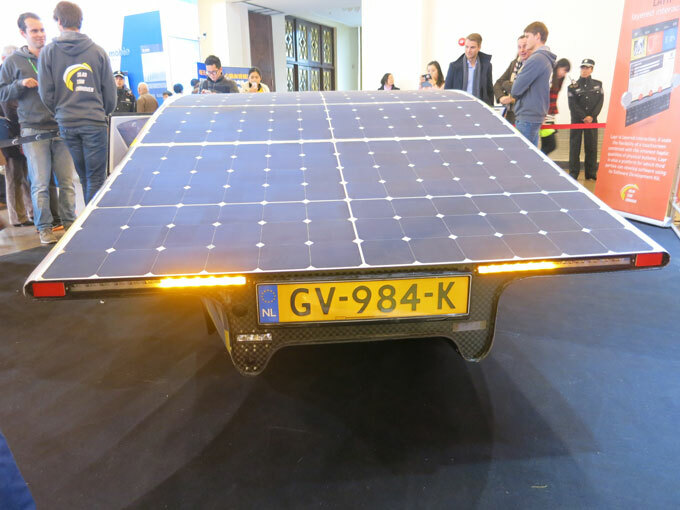 They’ve proven that a solar powered family car can be realized with current storage and PV technology. Their dream to commercialize the vehicle in the coming decade seems possible, and the car will be completely different from how we imagine cars right now. A large roof surface is a must, and.. instead of parking in the nowadays much preferred shade, in the future we’ll be fighting for the most sunny spot on the parking place! A new team of students from the TU in Eindhoven will start designing and building the next Stella Lux from September 2016. They’ll implement the latest developments in storage and PV technology and will further improve aerodynamics and reductions in weight. We wish them best of luck! From electric vehicle to solar car: an electrifying future? This technology is what we should incorporate into all vehicles. It is the future of transportation. I can't understand why more of a spotlight is placed on them. Would appreciate some info on motor type. Does it have air conditioning? Not practical without that to cool passengers in hot weather.